An Ordinary Life : Science: Why is it important to use soap? 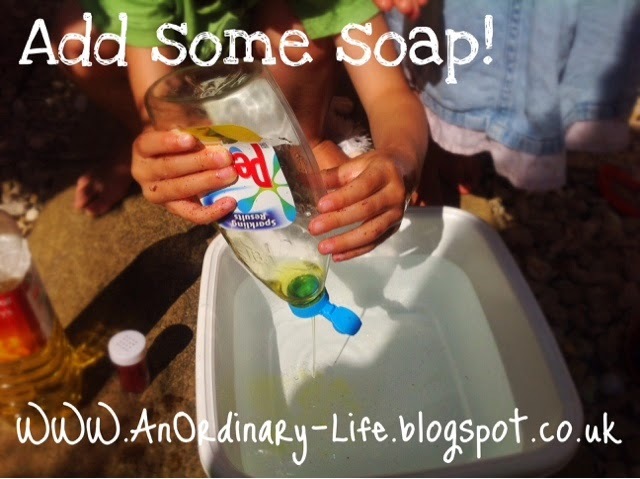 Science: Why is it important to use soap? 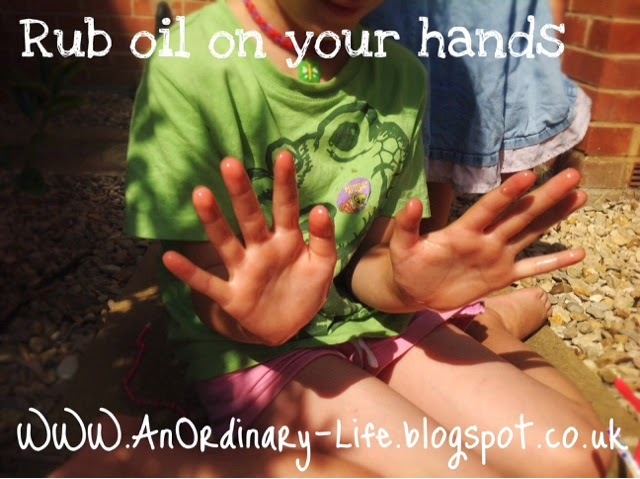 Honi, my six year old, is always trying to get out of washing her hands and it is SO disgusting! 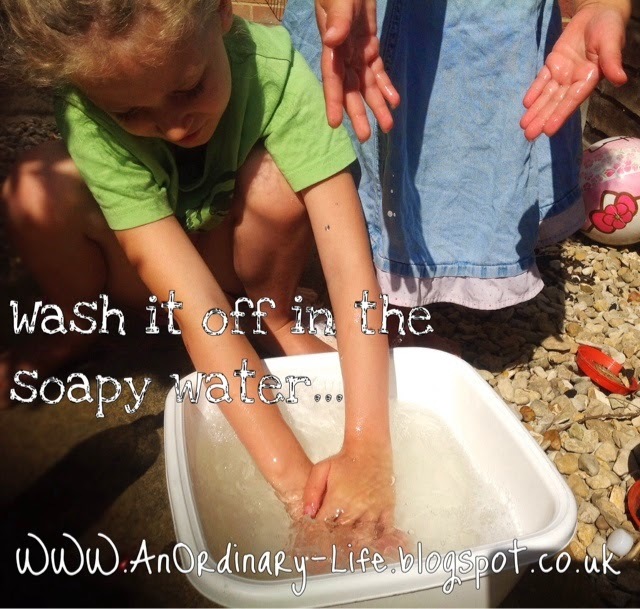 So I have been looking into ways to show her why it is important to wash your hands really well and why it is important to use soap to get it all off. This is what I came up with and it was a HIT! Why do we have to clean our hands? Why do we always use soap when cleaning things, whether it be dishes, clothes or our own body? 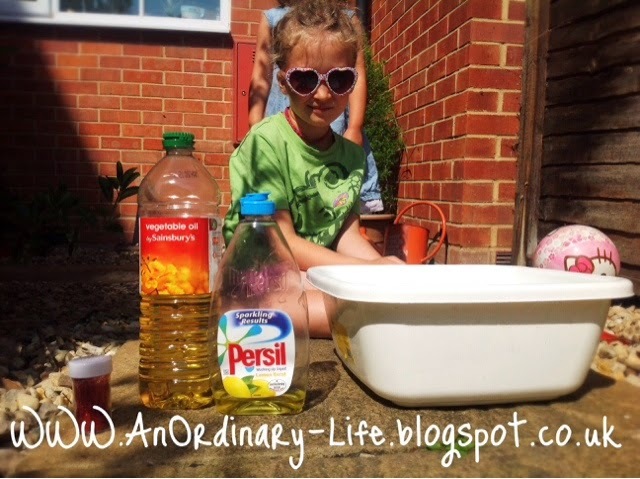 This is the experiment we did today, to discover how dirt works and why we use soap! A bowl - we used a washing up bowl for this. 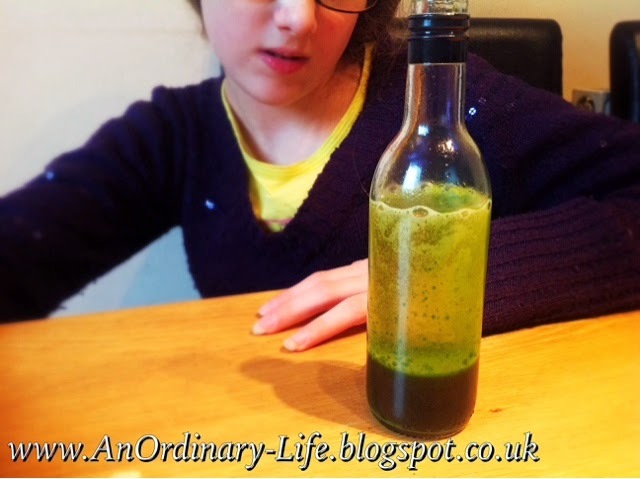 Put a teaspoon of oil in the palm your hand and rub it in! Sprinkle glitter on your hands now and rub your hands together again. What happened? 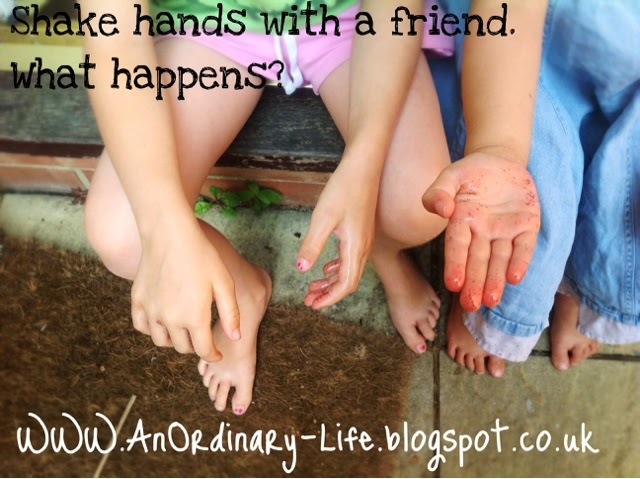 Now shake hands with a friend, but before you do. Guess, hypothesise, what will happen. Were you right? I pointed out that this is one of the ways that we pass on our germs to our friends. Guess, hypothesise, what you think will happen if you try to wash it off with plain water. Now try and wash your hands. Does it work? Not very well! We noticed that some of the water came off but not all of it. Now add soap to your bowl of water. 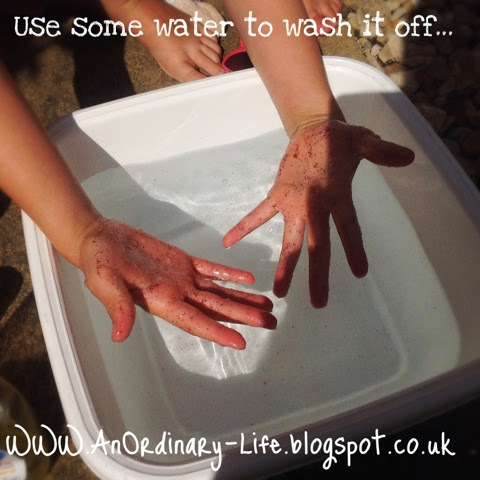 Try washing your hands again in the soapy water. It worked! When we get dirty oil, germs and dirt get stuck to us, this is the same with clothes and toys too. But the question is why isn't water alone enough to remove all the dirt? Some of the dirt and germs will come off with water, as we saw in STEP FIVE but not all. This is because oil is HYDROPHOBIC (meaning it hates water and therefore will not mix). Soap however is an EMULSIFIER - The emulsifier contains compounds that surround the non-polar molecules (the oil) and allows them to bond with the water; in this experiment, it is because they then stick to the water with the help of the soap (the emulsifier) that they come off our hands. 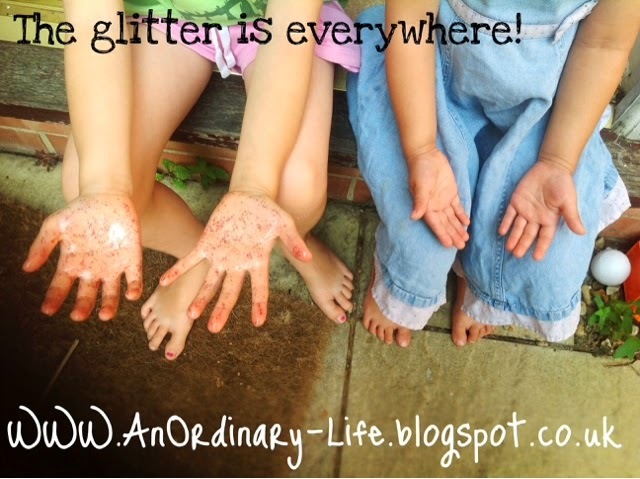 I asked Honi to imagine that the glitter was the grains of dirt and all the germs she picks up as she touches things like doors, floors, the table, things outside etc. 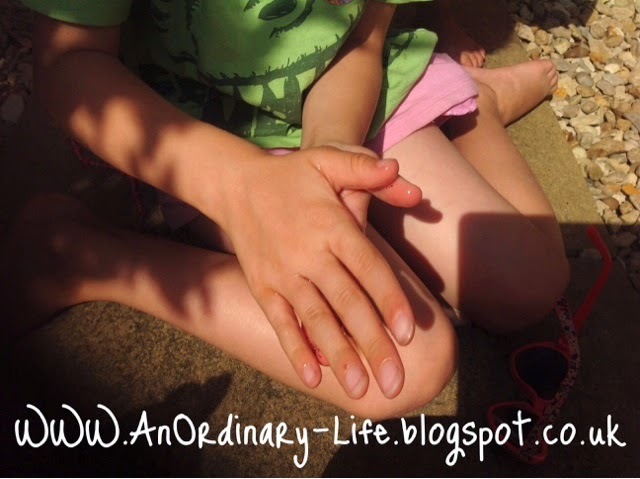 I highlighted again, that when she touched her sister's hand, these germs and the dirt, move from her to her sister. I pointed out that this is how we can catch illnesses from each other and why it is important to stay clean. This is brilliant and definitely something that I need to do with my five year old. my kids always try to escape washing their hands and say that they forgot.....yes right!!! !